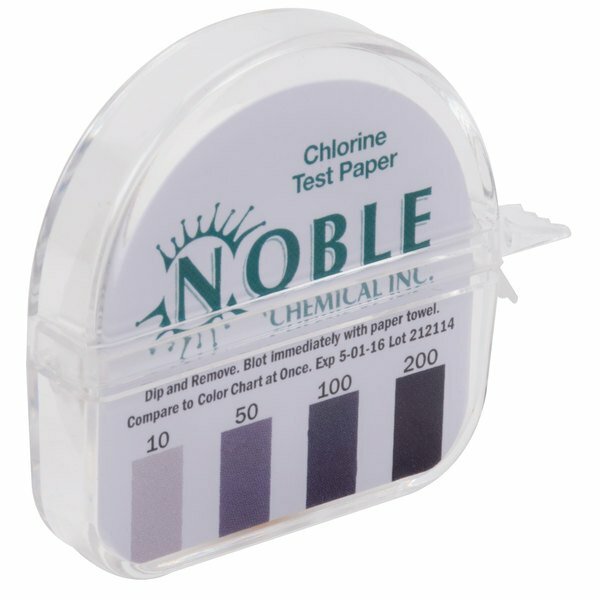 Use this Noble Chemical CM-240 chlorine test paper dispenser to ensure your solutions are safe for use. 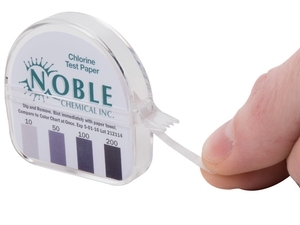 This Noble Chemical CM-240 chlorine test paper dispenser is an essential product for your restaurant, dining hall, cafeteria, healthcare facility, or foodservice establishment. 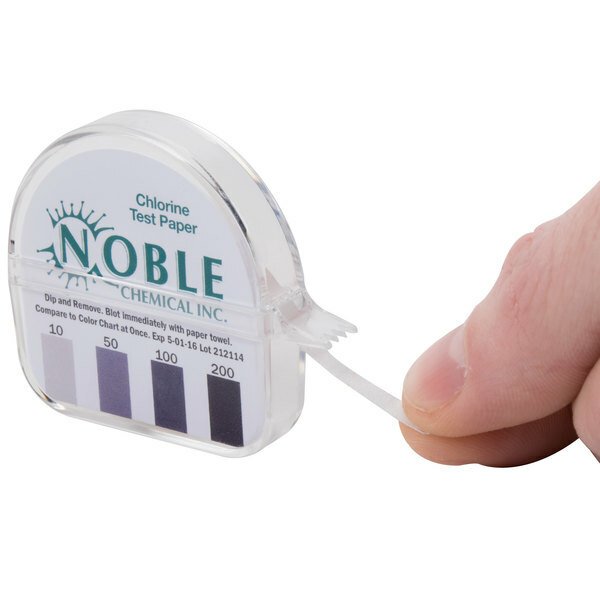 Using this kit allows you to easily measure the concentration of free available chlorine in your sanitizing solutions. By having this dispenser on hand, you’ll be able to comply with Federal, State, and Local health regulations that require users of chlorine-based sanitizer solutions to have appropriate test kits available to verify the strength of their solutions. Also, since this kit is easy to use, employees can quickly train others to test chlorine levels. "I used these test strips all the time. If you are in the restaurant business or any food business you have to have these to test the PPM of your bleach"
This chlorine test paper dispenser includes everything you need to start testing your sanitizer. 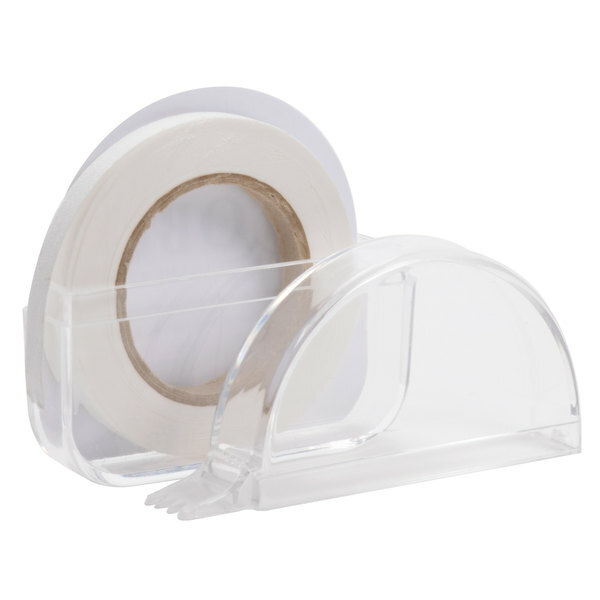 Each product purchased comes with a plastic dispenser, color chart, and (2) 15’ rolls of test paper, which provide approximately 200 tests per roll. Since the test papers are packaged in a plastic case, they’ll have some level of protection from water and other liquids that can cause them damage. However, they should not be stored in humid environments. Also, the case has a serrated edge that makes it easy for users to tear off a strip of the test paper. Additionally, instructions are printed on the case for the user's convenience. The test paper measures concentrations between 10-200 ppm, with color matches at 10, 50, 100, and 200 ppm. The distinct color match at each full unit makes it easy for users to identify the correct chlorine level. This test produces quick results. 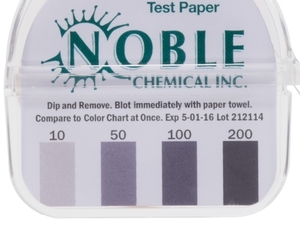 Simply tear off a small strip of the test paper, dip it into your sanitizing solution, blot it with a paper towel, and instantly compare the resulting color with the matching chlorine color chart. 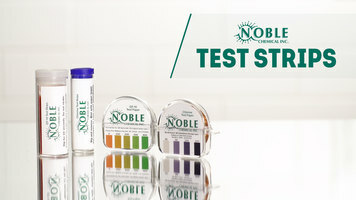 Whether you need a quaternary or chlorine test to help keep your establishment up to code, these Noble Chemical test strips are sure to help with the job. Check out this video to learn more! Keep up with health codes with these Noble Chemical test strips. We offer both quaternary and chlorine tests depending on your type of sanitizer. Both are available in rolls, which can be torn to a desired length or in pre-measured strips. Each bottle or dispenser comes with clear, easy-to-follow instructions to ensure accuracy. The quaternary test takes about 10 seconds, and the chlorine test is practically instantaneous. To make things as simple as possible, there's also an included color comparison chart in each kit. Simply compare your results to the chart to ensure proper levels. Dialing in just the right amount of sanitizer is important. You want to be using enough to effectively sanitize, but using too much is just like pouring money down the drain. The quaternary test measures from 0-400 parts per million, while the chlorine test measures 10-200 PPM. By finding the perfect balance, you'll be able to maximize profits while complying with regulations. Test strips work great, and they're easy to read. The plastic case keeps the strip perfect, and colour chart is listed right on the back for easy reading. 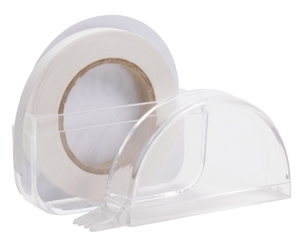 Easy to use, we do prefer the strips over the tape, but this is a great back up and very easy to read. good value! A product that does what it is supposed to do. Works well, and this is the cheapest you can find! Worth the price. I recommend it. Great test paper to let the health department know you are on the up and up. I find them very useful in our ice cream shop because I hire a lot of people that have no restaurant experience. This takes the guess work out of the equation for these employees - I know that they prepared the chemicals correctly now. Well not sure what to really say here it's testing strips they work like they are supposed to work in order to check sanitizer concentration. The Nobel Chemical strip works great! It's an easy way to check and maintain your chemical levels when you are sanitizing clean dishes. It's easy to use and understand. We have re-ordered several times! Perfect test strips to test water for bleach content. I need this for the health department and they are happy with the product so I am too! 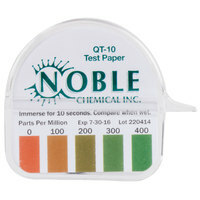 This test paper makes it so easy to test the ppm of your chemicals. This product works great and is so economical! Buy a couple to set by all your sinks. Couldn't do my job without it! The plastic container keeps the test paper clean and dry and the comparison guide makes it easy to check for the right chemical strength in the water. 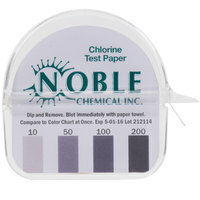 Noble CM-240 chlorine Test paper strip dispenser works with testing a bleach solution for disinfecting. Easy to use and to read results. Would recommend purchasing a sanitizing pail. Even if you don't use them every day, you need a pack of these in your kitchen near your sink. If the health inspector comes in, they expect to see these test strips. These work great and the container is handy! Always keep them nearby so you can test the sanitizer water every so often. The health department loves these too. We needed new test strips for our coffee shop/bakery sanitizer buckets and dishwasher, this product has worked great for us! Strips are in one continuous roll, it pulls out easily and tears to exactly the size you want, no unnecessary waste! Very low cost! 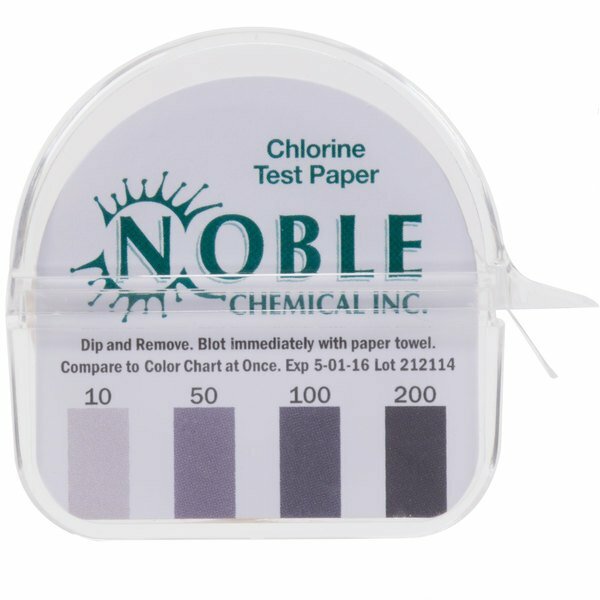 It is a great product to test the chlorine in my sink. It is very important for health dept, and the result arrives very fast. It lasts for a very long time, and I will keep purchasing it with the 25% off automatic purchase. This health department requirement is a great product. Works every time to assure safe cleaning levels of chlorine in your water chlorine mixed bottles. Great price. Great test strips, I love the idea of being able to tear it off where you want it. The strips are not premeasured so you can make them as long or as short as you want them. Works well, instant reading.